Not sure what to get Dad for his special day? Forget the typical tie or wallet, and check out these unique Father’s Day gift picks. Whether he’s an athlete, a tech-junkie or a suit and tie kind of guy, giving one of these will surely put a smile on his face! Dress up Dad’s everyday business shirt with a hip pair of cufflinks that are made with authentic transit tokens from his favorite city. These super cool cuff links are packaged in a custom box with a picture of the city’s transit map. City choices include New York City, San Francisco, LA, Boston and Chicago. Is your dad interested in keeping his skin looking good, in the most natural way possible? ARCONA MEN is an all natural luxury skincare line created just for men. These fresh-smelling products contain live, active ingredients which make them unique. Celebrities such as Adrien Brody and Steve Carell have been using them for years. My husband was the tester and is now a big fan too. I like the sleek packaging and the products have clever “manly” names such as efficiency, productivity, consistency, proficiency and restore. Kit includes a daily cleansing bar, moisturizer, exfoliating facial scrub, skin toner pads (perfect quick fix to relieve razor burn) and wrinkle-repair formula. Whether Dad goes to the gym every morning, likes to go for a run, or plays a game of pick-up basketball every now and then, Under Armour has an array of apparel fit for him. Under Armour’s new line, Charged Cotton™ combines the company’s original wicking technology that allows for breathability with the softness and durability of cotton. In fact, this is the first performance cotton t-shirt that actually dries much faster than regular cotton. Worried about sweat stains or poor quality? Under Armour Charged Cotton™ will keep Dad cool and dry, allowing him to perform as usual, while still looking great. I love the variety of bright colors available. If your Dad likes to plan golf outings with his buddies or hit golf balls at the driving range, this new portable club will be the perfect gift. The Hammacher Schlemmer 33-In-1 Golf Club appears to be like any other classic iron, but it has the ability to adjust to 33 different loft angles. The gear system inside the heel of the club allows golfer to choose from five putters, two drivers, three fairway woods, 14 irons or nine wedges. Dad will certainly be the envy of all his friends! This golf club on steroids retracts to 19 inches, comes in a convenient carrying case and fits in a suitcase so it’s ideal for travel. For the early adopter Dad who loves the latest gadgets, be sure to get him a BlackBerry Playbook. This new tablet is smaller than the iPad (7’ screen), weighs less than a pound, and is less than 1/2 inch thick. It offers unique capabilities such as a “multi-task” feature that allows you to run multiple programs at once (view videos in HD, browse web pages, check emails, run apps). Perfect for BlackBerry lovers, the Playbook has the ability to connect directly with a BlackBerry smartphone and can be used to view any email, BBM and other content on the phone. This portable gadget can even video chat, record and stream videos in HD. Sure, a towel works for when Dad is rushing in and out of the shower, but I am sure he would enjoy a plush, hotel-style robe to strut around in too! 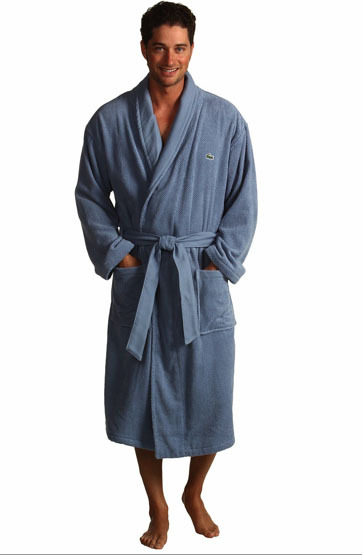 This luxurious robe is made of 100% textured cotton and is casual and comfortable. Designed in France, these come in four great colors and of course feature the iconic crocodile logo.